World 200m champion Veronica Campbell-Brown of Jamaica has been provisionally suspended from competition after a positive test for a banned substance. 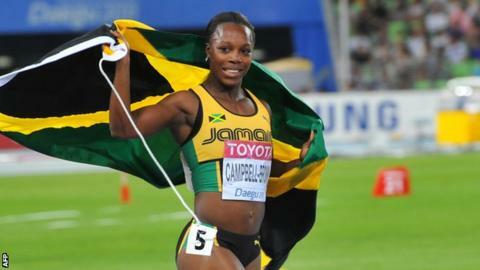 Campbell-Brown, 31, tested positive on 4 May for a banned diuretic. She is suspended pending her "B sample" result, the Jamaican Athletics Administrative Association said, and faces a two-year ban from athletics. Her management company said she would seek to clear her name, adding "Veronica is not a cheat". The banned diuretic for which she tested positive at the Jamaica Invitational meet is considered by the World Anti-Doping Agency to be a masking agent. "The Jamaican Athletics Administrative Association can now confirm that a case concerning Mrs Veronica Campbell-Brown is currently ongoing," the governing body said. "She has been provisionally suspended from competition awaiting the outcome of a disciplinary panel that will be empanelled to hear this case." Campbell-Brown won 200m and 4x100m relay golds at the 2004 Olympics in Athens and retained her 200m title in Beijing four years later. She has won 16 medals for her country in world and Olympic meets and at London 2012 took bronze in the 100m and was a member of Jamaica's silver medal-winning sprint relay team. The statement from her management company said the charges were "a shock to her, her loyal supporters, and many others in not just sports but also the other spheres into which she has extended herself to help". It continued: "She has, via hard work and dedication, accomplished a record on the track which is absolutely remarkable. She remains an ardent believer in the purity of competition, the beauty of the sport and resolute in the fact that unearned suffering has redemptive qualities. "She will begin the process of clearing her name."